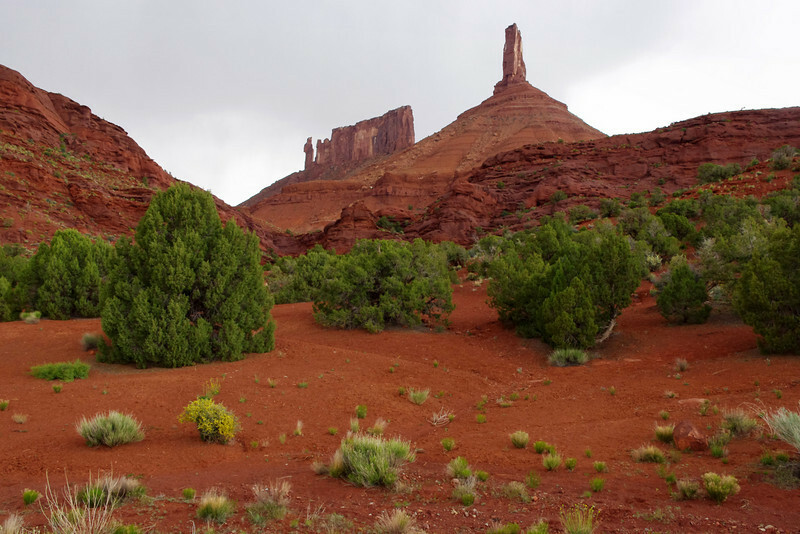 Car camping and hiking in Arches and Canyonlands. This is my first gallery of photos from a digital camera. 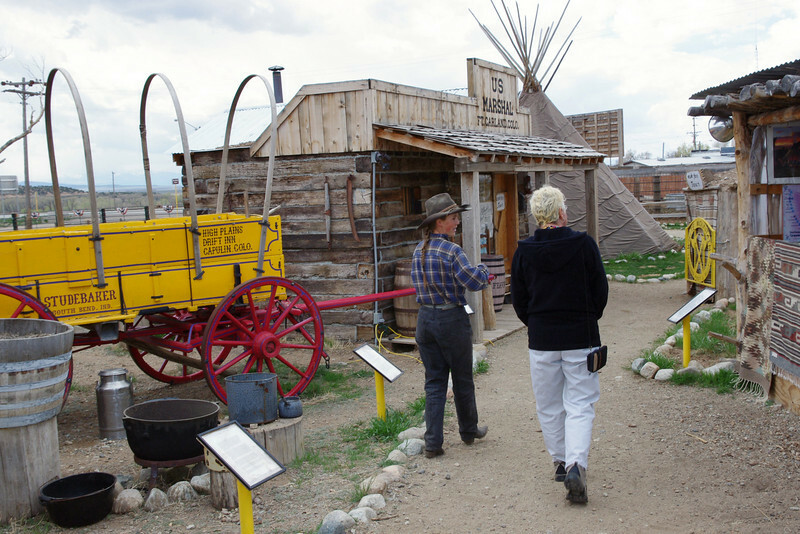 The White Mountain Trading Post Living Museum, Fort Garland, Colorado. 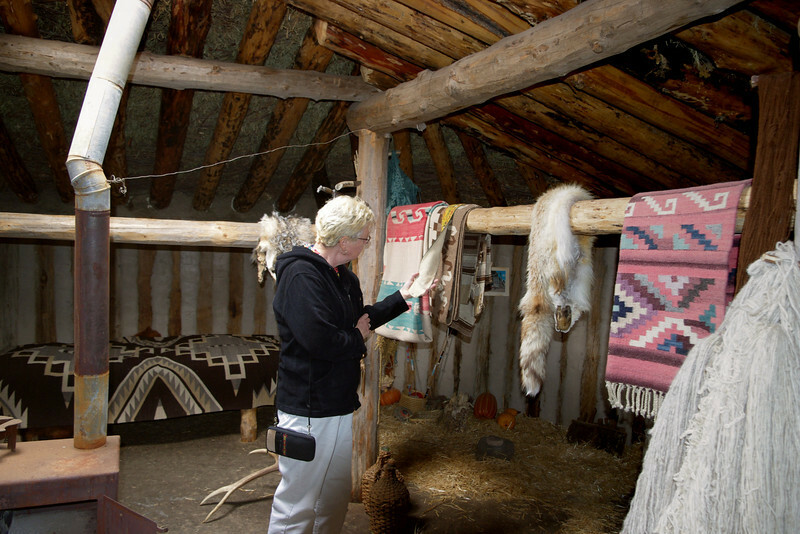 Rita looks at Navaho blankets in the hogan at the White Mountain Trading Post Living Museum, Fort Garland, Colorado. 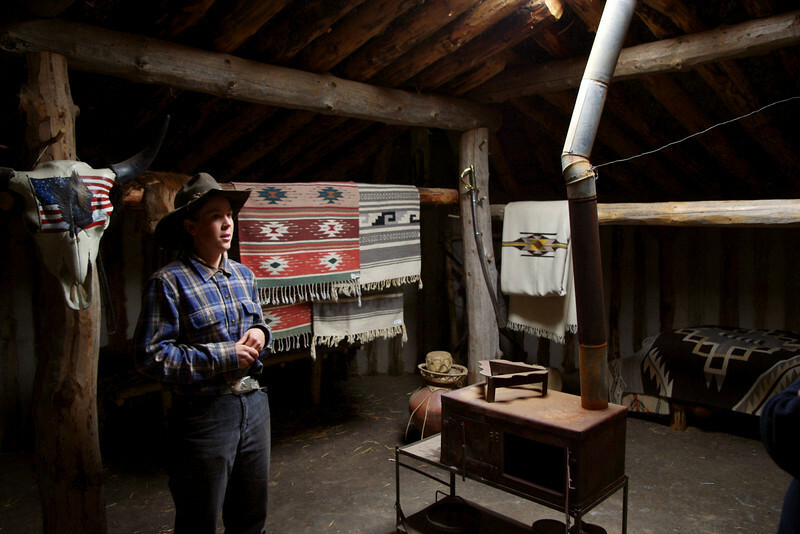 Most hogans I have seen, including the one at the Navajo Tribal Museum - http://garywright.smugmug.com/Travel/Canyon-de-Chelly/7756411_wSSoa#501565970_AGYgy-A-LB - have the wall logs running horizontally. Our guide claims these vertical wall logs are the Real Deal. 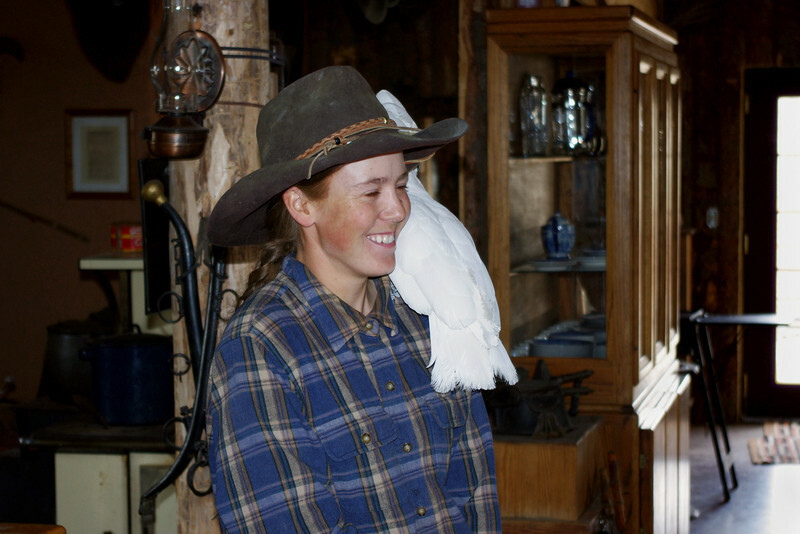 Talking birds, like this one, were said to be kept in many trading posts to provide protection from the natives. They believed the soul of a man was trapped inside the talking bird and would not burn down the trading post for fear of harming an innocent man. 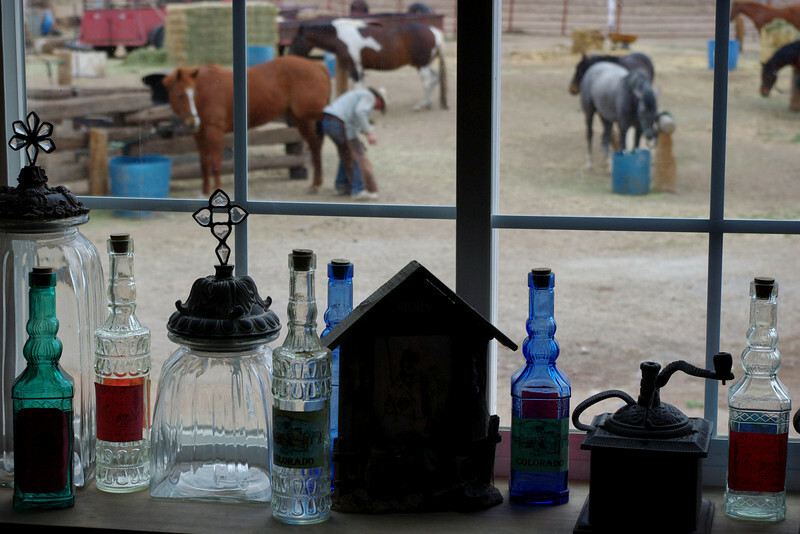 Bottles in the window of the trading post at the White Mountain Trading Post Living Museum, Fort Garland, Colorado. Note the horse being shod in the background. 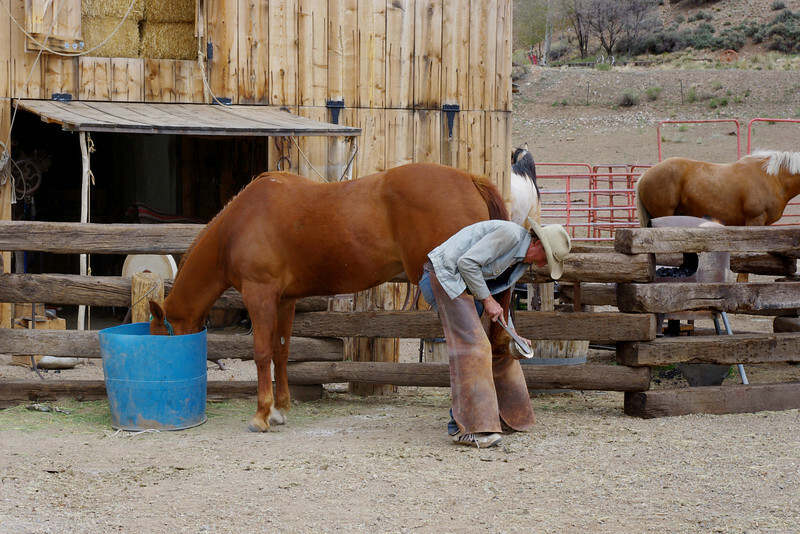 A horse being shod at the White Mountain Trading Post Living Museum, Fort Garland, Colorado. 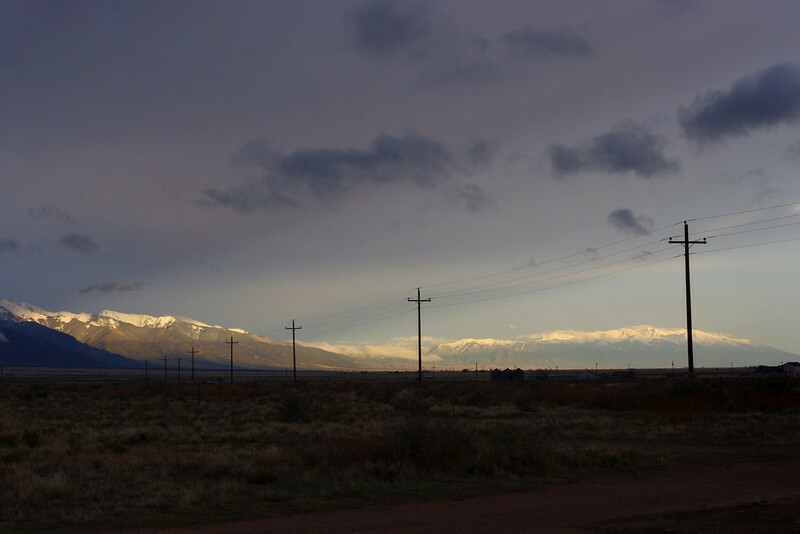 Weather over the Sangre de Cristo Mountains, San Luis Valley, Colorado. We noticed the grass growing in circles - why? 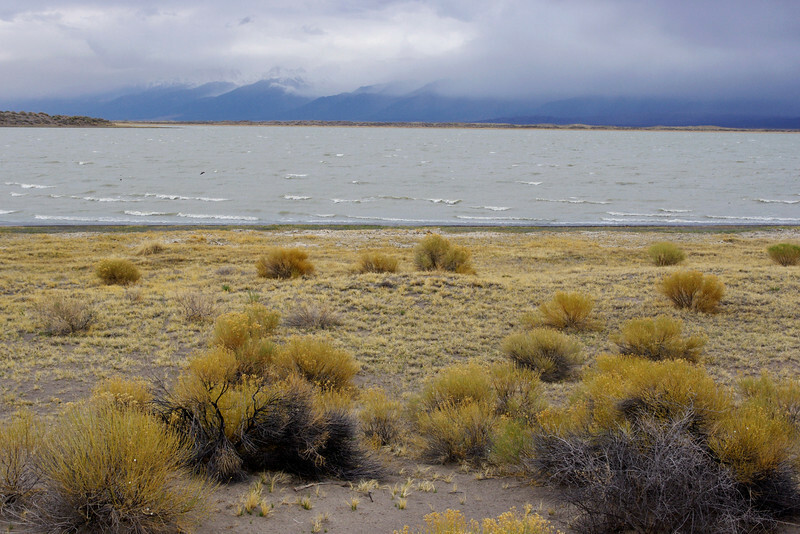 San Luis Lake, Colorado. It was so windy here, I imagined that all I would need to become airborne would be a poncho or table cloth to act as a para-sail. 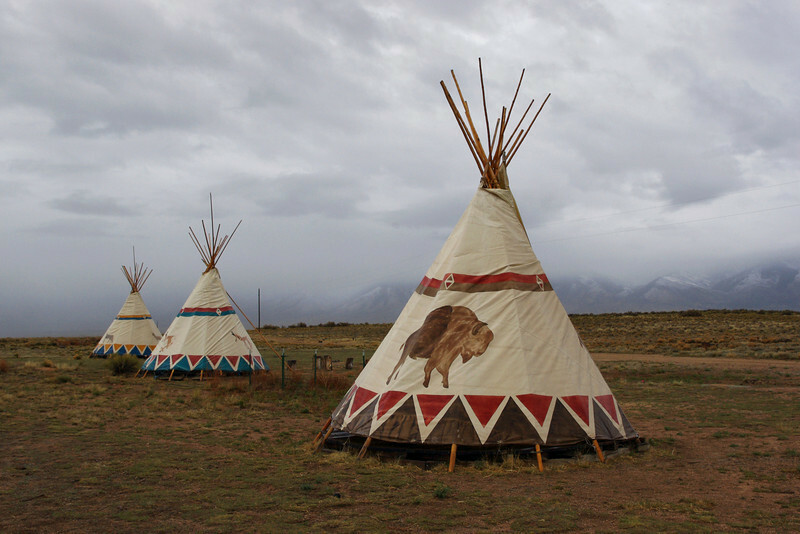 Tipis (for rent) at Joyful Journey Hot Springs, San Luis Valley, Colorado. 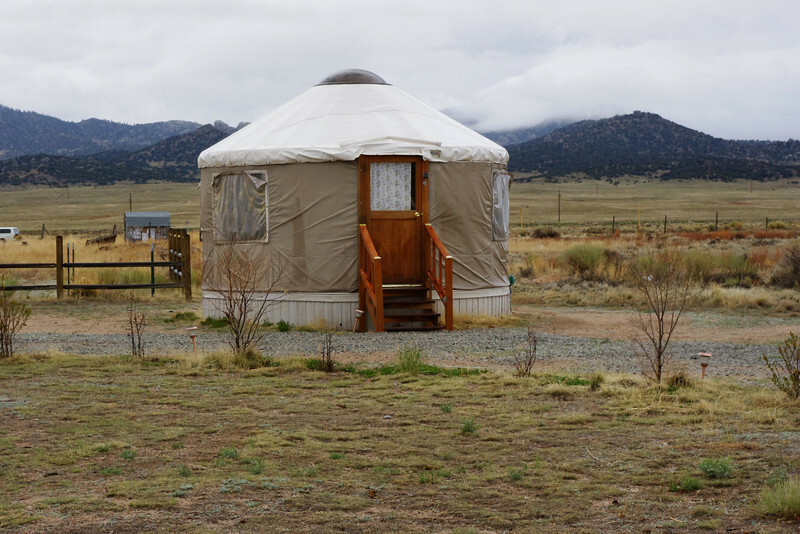 Yurts (for rent) at Joyful Journey Hot Springs, San Luis Valley, Colorado. 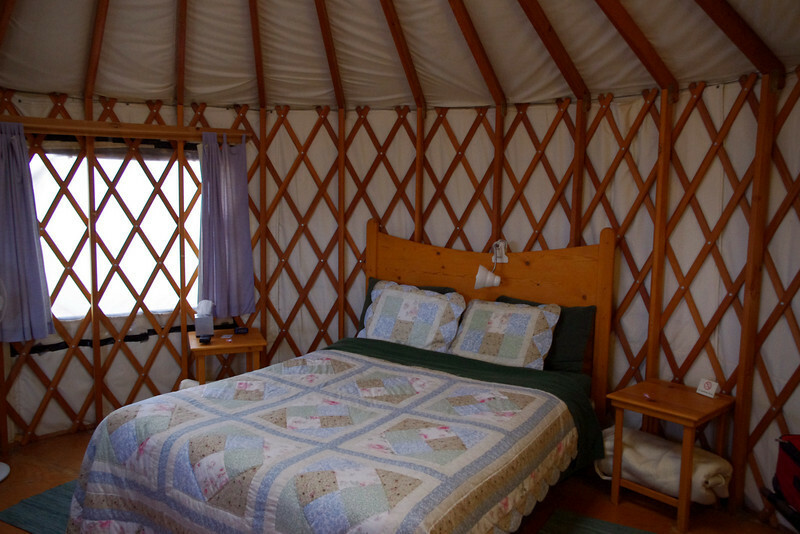 Inside our yurt at Joyful Journey Hot Springs, San Luis Valley, Colorado. 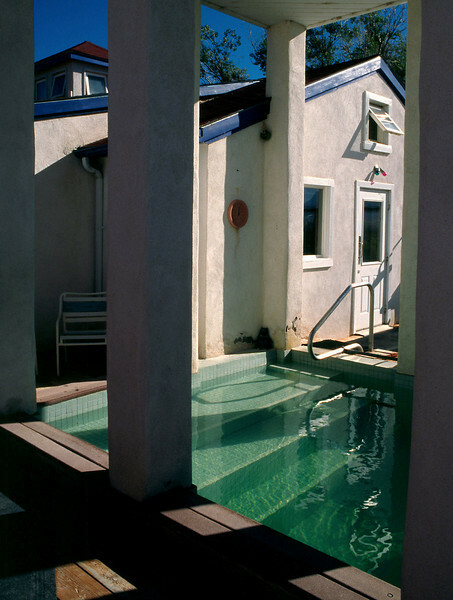 Hot springs baths, Joyful Journey Hot Springs, San Luis Valley, Colorado. 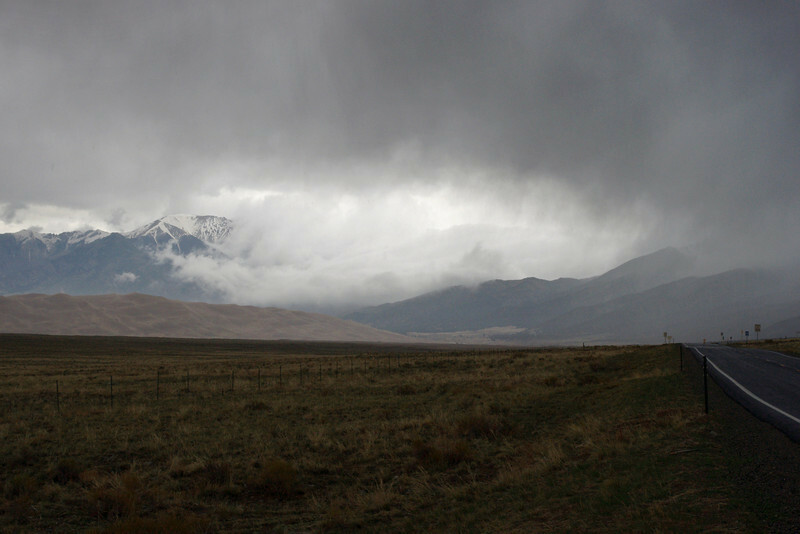 If you are ever anywhere near Great Sand Dunes National Park in Colorado, you MUST seek out nearby Joyful Journey Hot Springs! 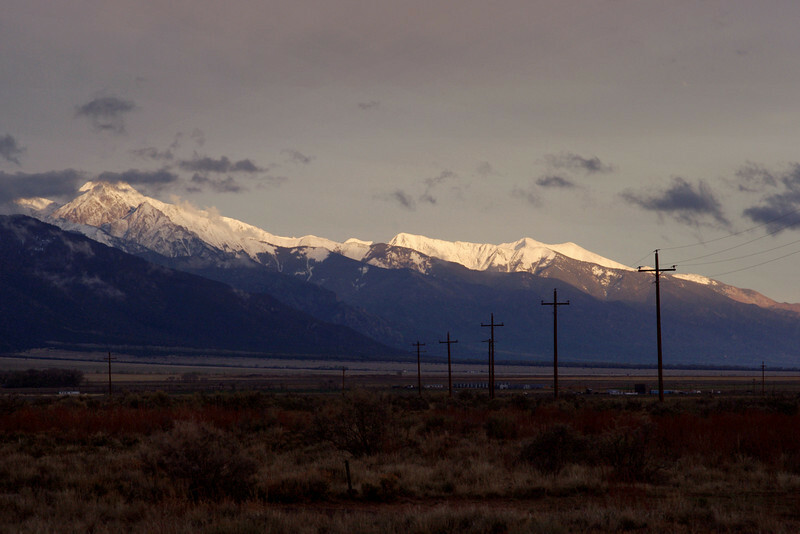 View of the Sangre de Cristo Mountains, from Joyful Journey Hot Springs, San Luis Valley, Colorado. 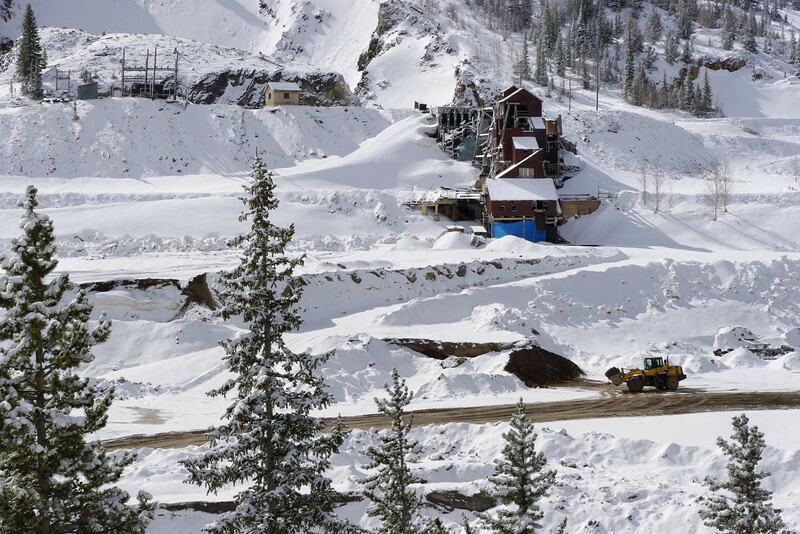 Mining; approach to Monarch Pass on Colorado US 50 from the east (Salida). 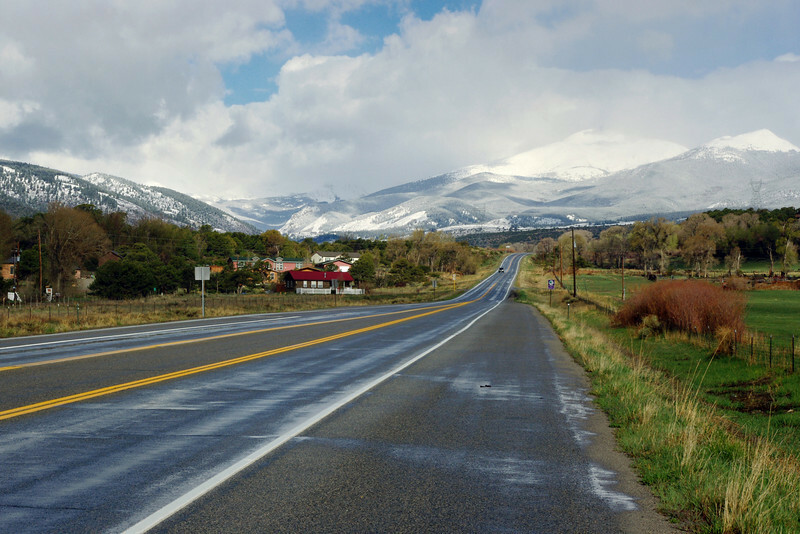 Monarch Pass on Colorado US 50. Icy conditions almost resulted in catastrophe. 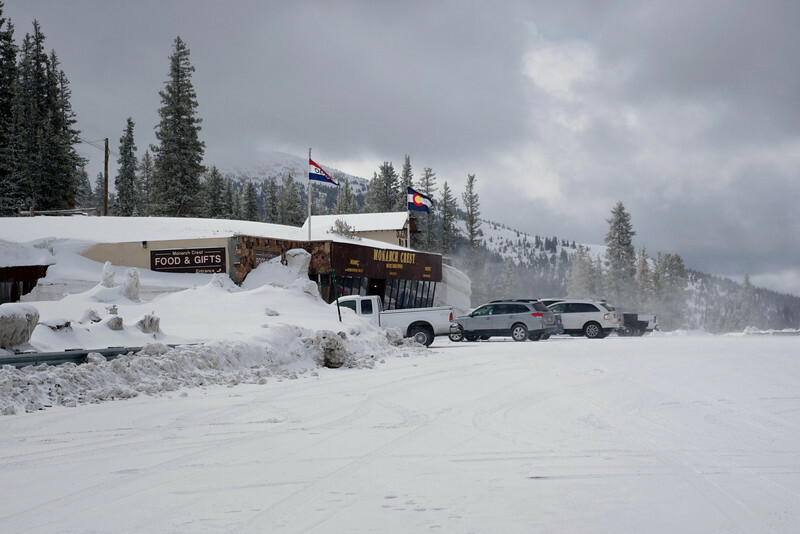 After we topped the summit (11,312 ft) and started down the other side we saw a red faced woman walking in the snow beside the road and waving her arms. While she was telling us about the truck jackknifed across the road just around the next bend, another car almost slid into us. 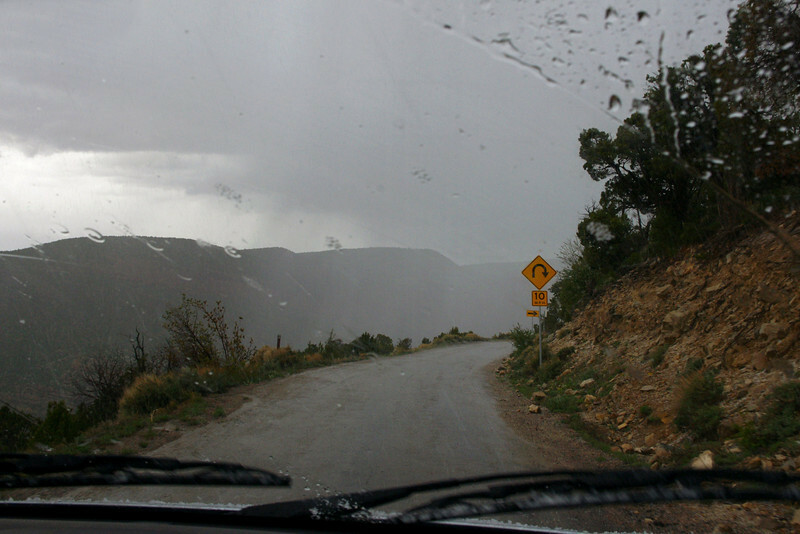 We made it back to the top where I spent the next hour waving down cars to warn them of the blocked road. 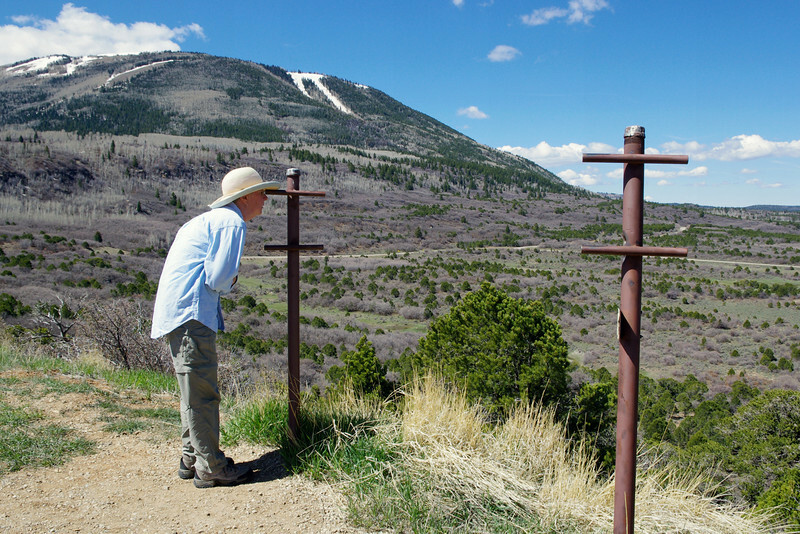 After the emergency vehicles showed up, we turned tail, went back down the way we came, and headed south, to cross the divide on 160 over Wolf Creek Pass. 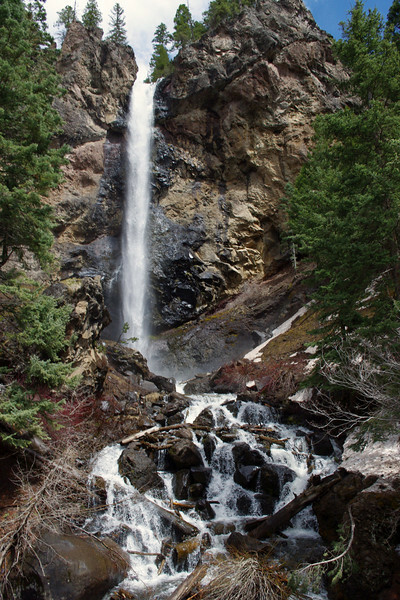 Waterfall on US 160 near Wolf Creek Pass. 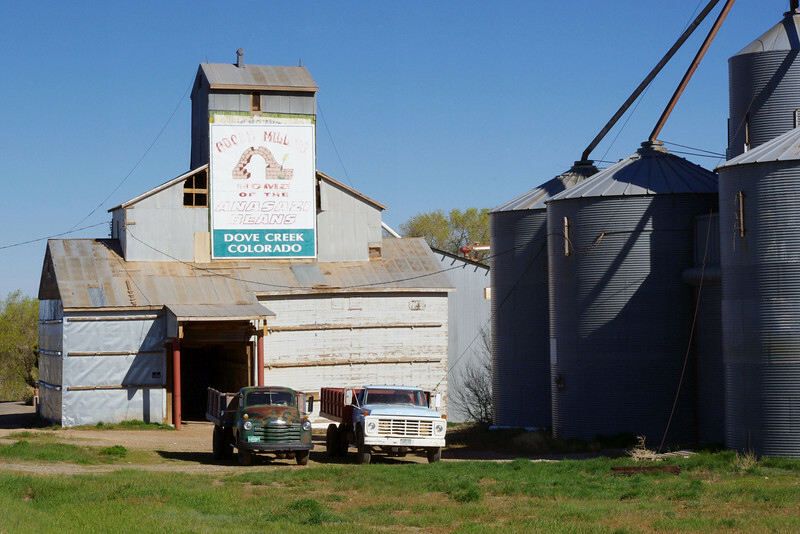 Adobe Bean Mill, Dove Creek, Colorado, with trucks. Rita, looking through a metal tube, which points to a distant point of interest. 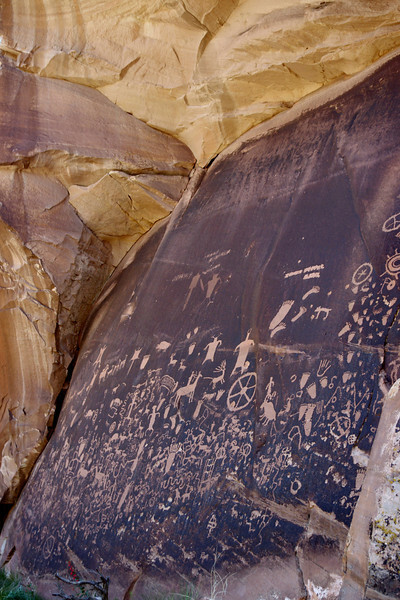 Newspaper Rock State Historic Site, where ancient (and not-so-ancient) petroglyphs have been pecked into the desert varnish. Utah 211 just north of the Abajo Mountains. 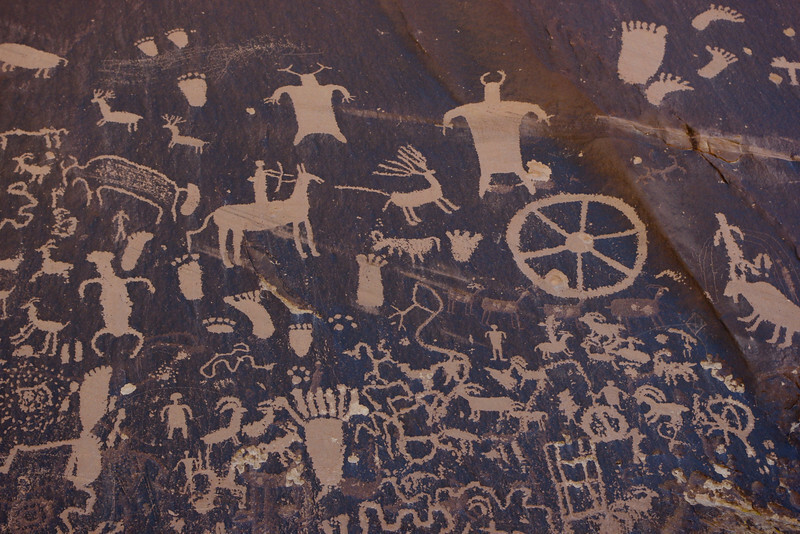 Newspaper Rock State Historic Site, detail. 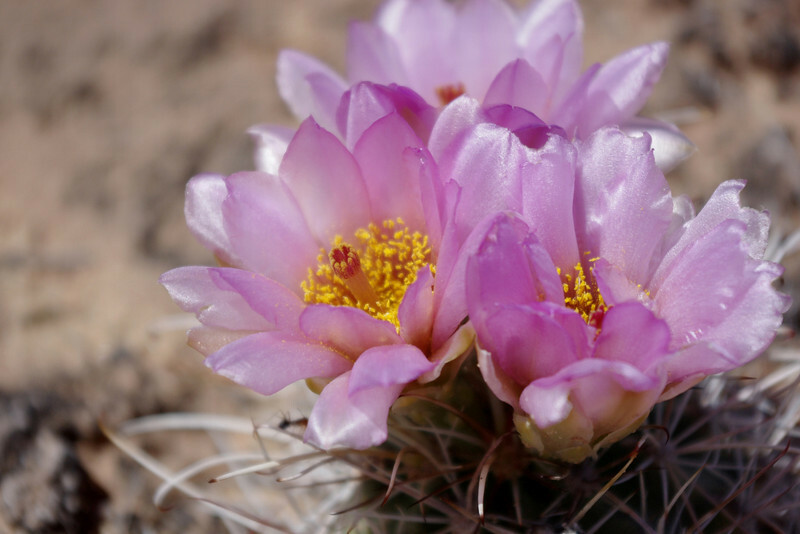 Cactus blooms, Canyonlands National Park. 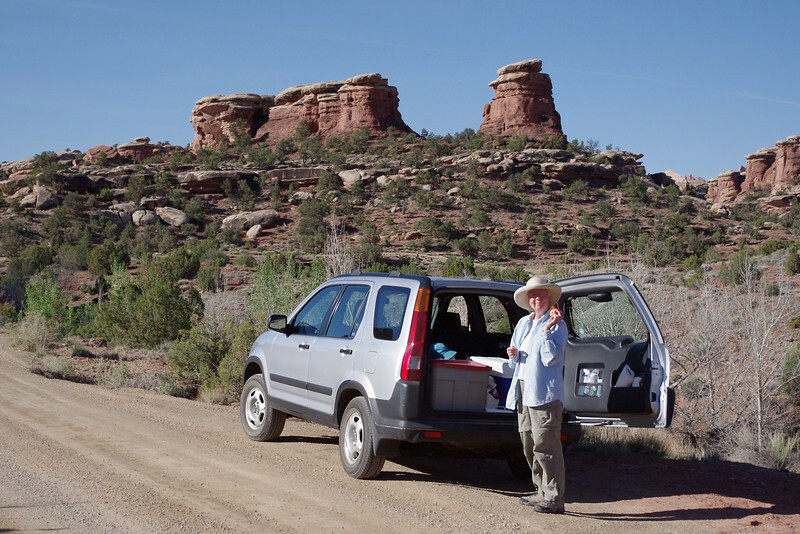 Rita in Canyonlands National Park, Utah. 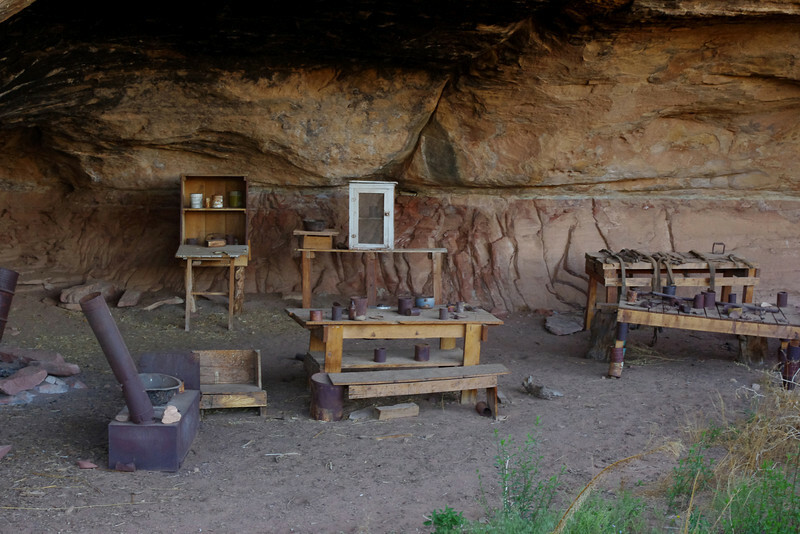 Old cowboy camp on the Cave Spring Trail, Canyonlands National Park (Needles District), Utah. 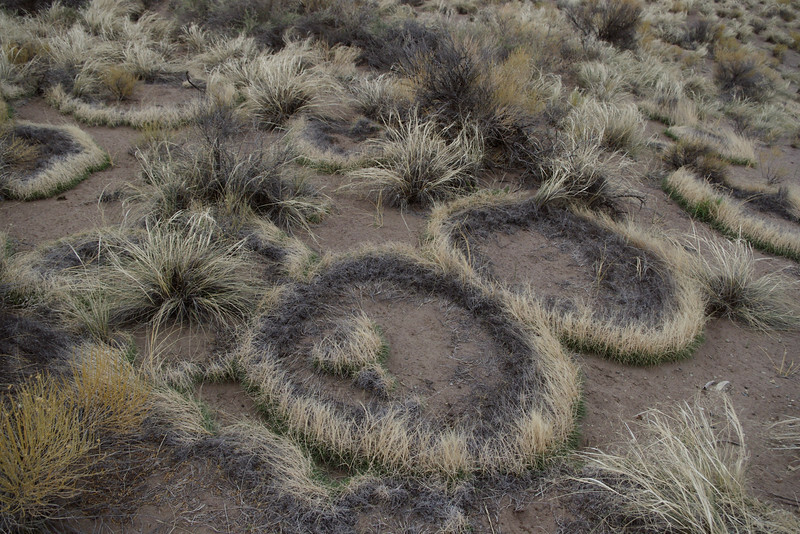 Before Canyonlands became a National Park, cattle were grazed on the sparse grass there. This overhanging bluff provided shade and a small spring; Cowboys, like the Natives before them, used the hollow bluff for shelter. 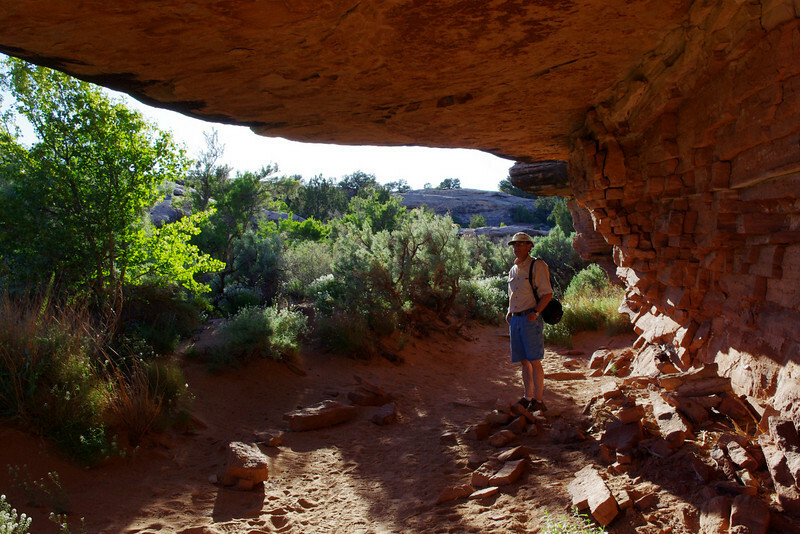 Rita at the old cowboy camp, Cave Spring Trail, Canyonlands National Park, Utah. 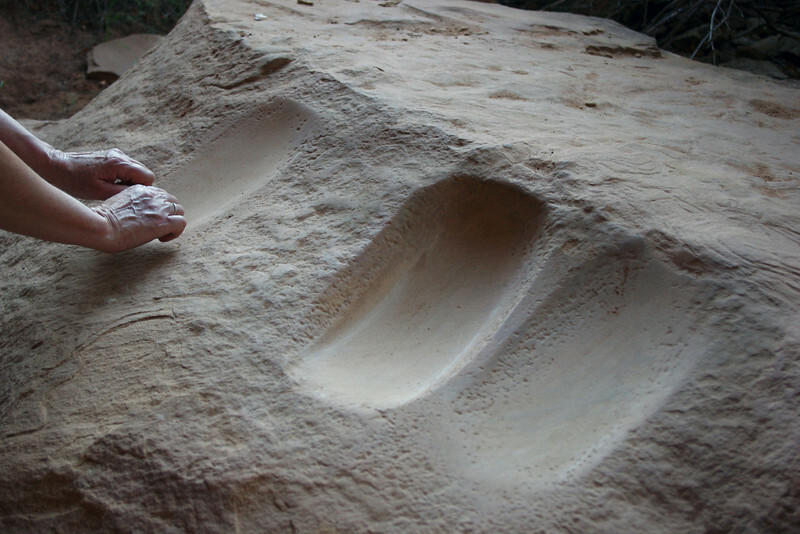 Old grain grinding grooves, once used by Native Americans. 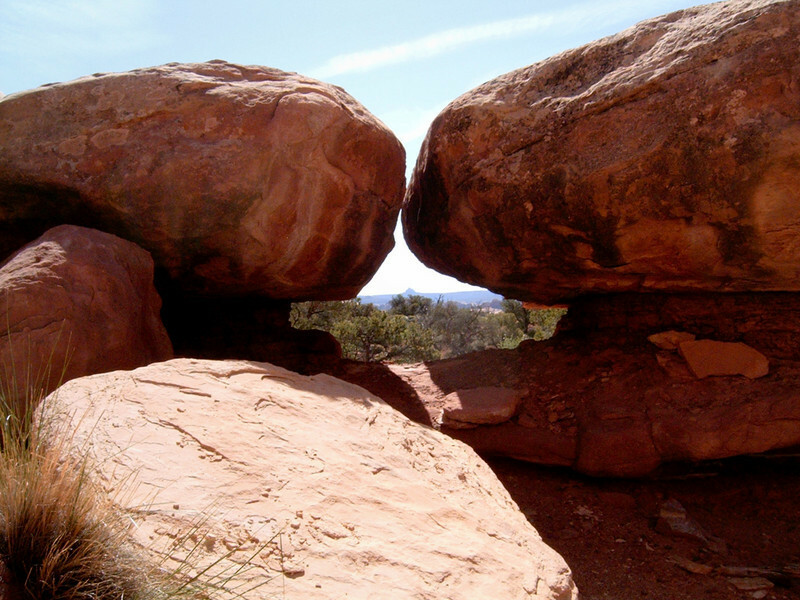 Cave Spring Trail, Canyonlands National Park, Utah. You can almost see the hands of an old squaw working here. 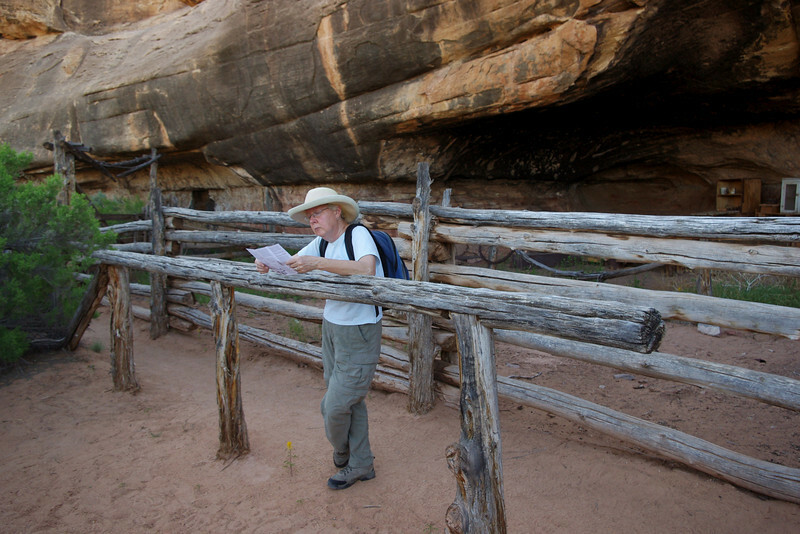 Gary on the Cave Spring Trail, Canyonlands National Park, Utah. 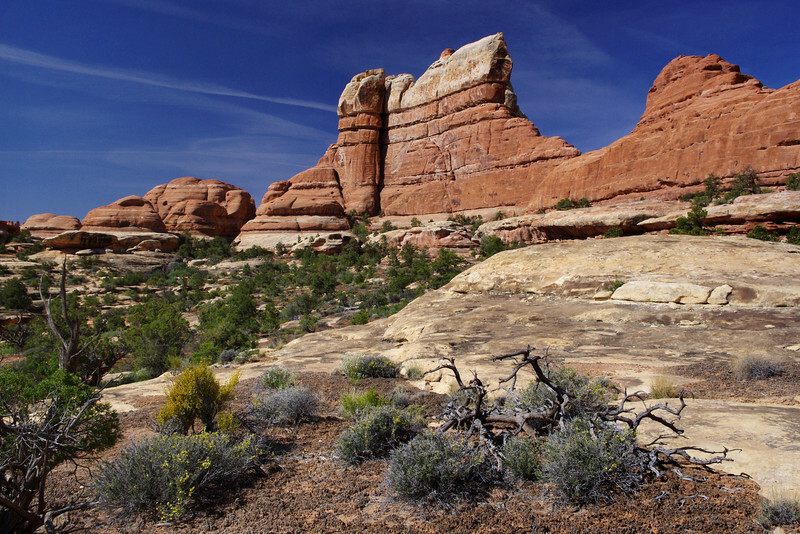 Rocks, Canyonlands National Park, Utah. Rita snacking on an apple, Canyonlands National Park, Utah. 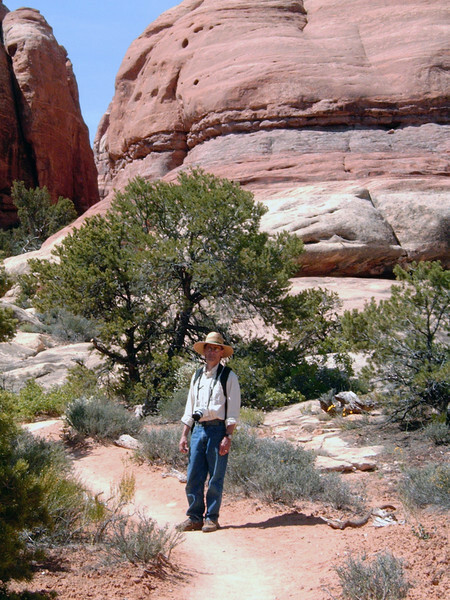 Gary, hiking the Chesler Park Trail, Canyonlands National Park (Needles District), Utah. 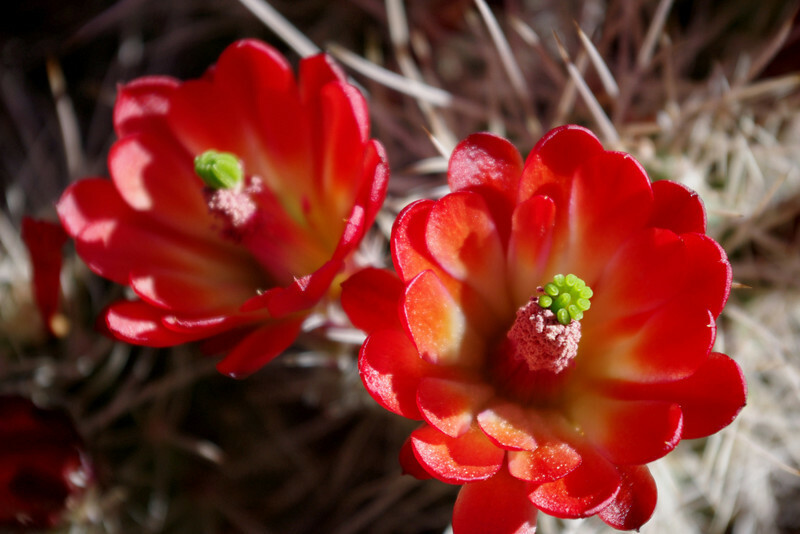 Claret cup cactus blooms, Chesler Park Trail, Canyonlands National Park, Utah. 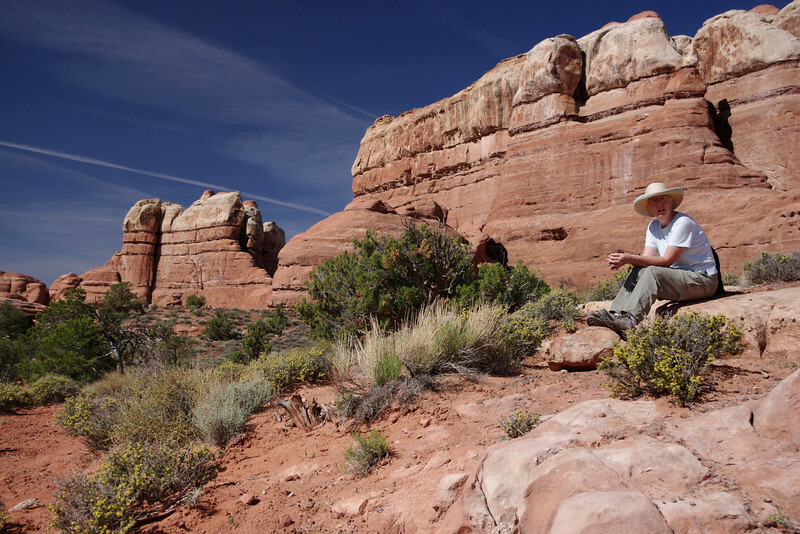 Rita, resting on the Chesler Park Trail, Canyonlands National Park (Needles District), Utah. 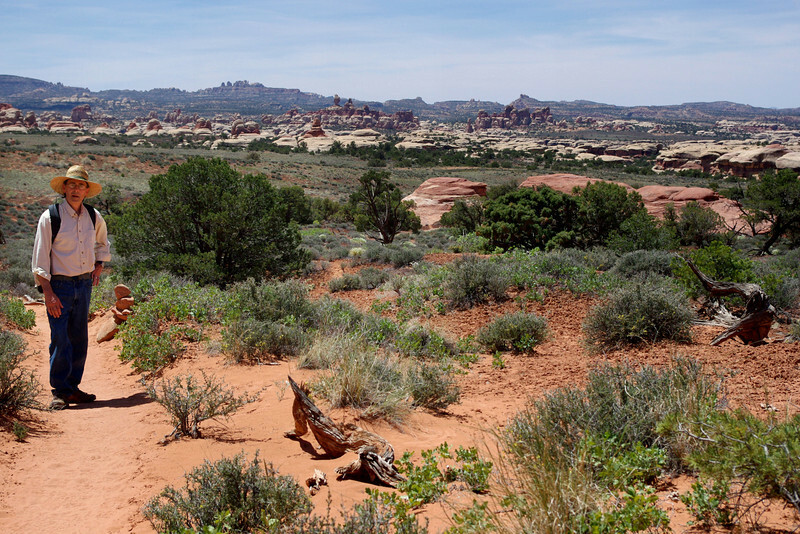 Desert landscape, Chesler Park Trail, Canyonlands National Park, Utah. 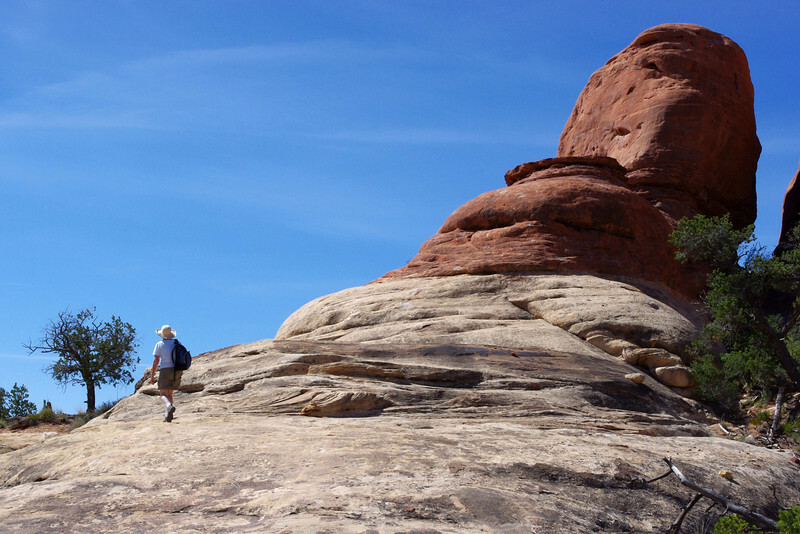 Rita, hiking the Chesler Park Trail, Canyonlands National Park (Needles District), Utah. 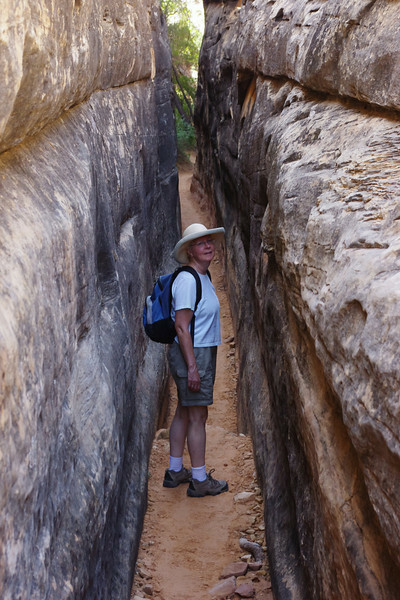 Rita, in a tight place, Chesler Park Trail, Canyonlands National Park, Utah. 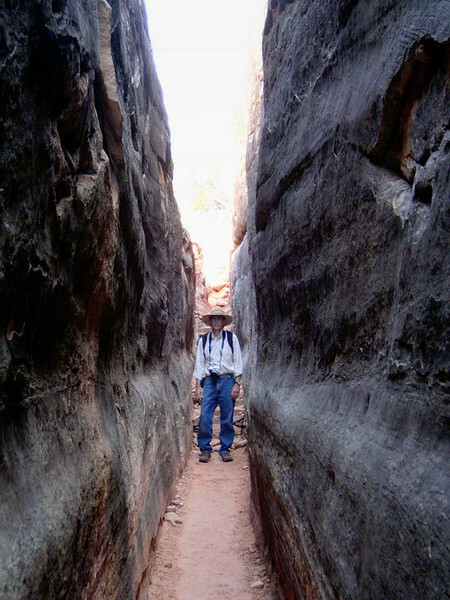 Gary, Chesler Park Trail, Canyonlands National Park, Utah. 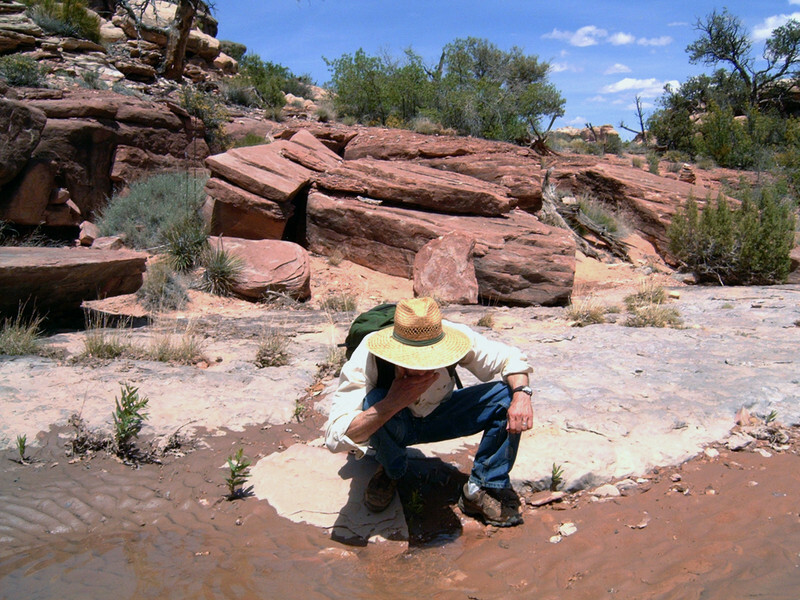 Gary, cooling his brow in a pool in Elephant Canyon, on the way to Chesler Park. 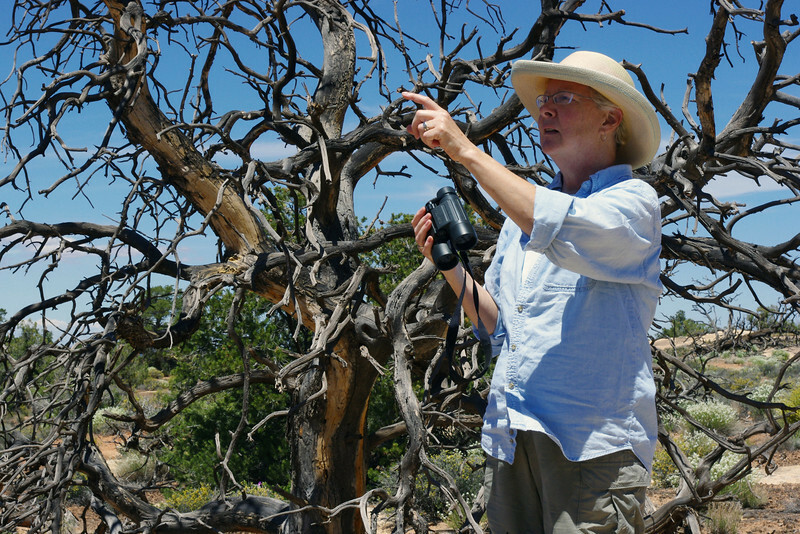 Gary in Chesler Park, Canyonlands National Park, Utah. 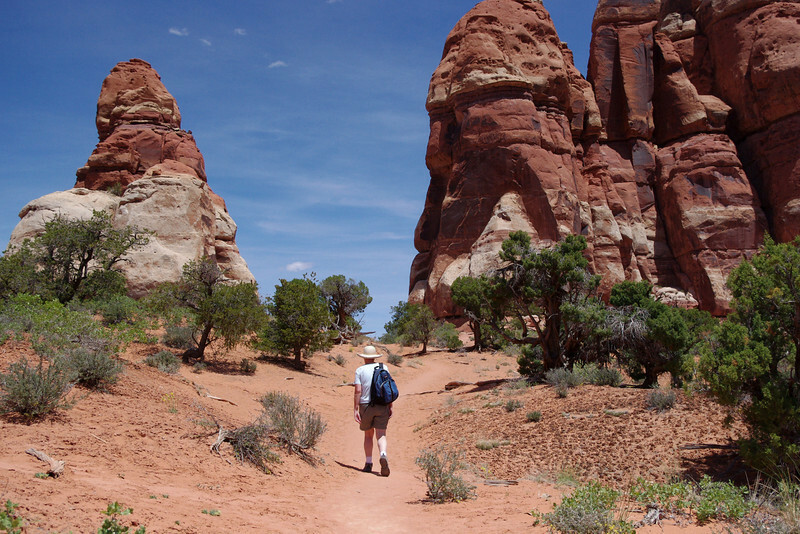 Rita, hiking the Chesler Park Trail, Canyonlands National Park, Utah. 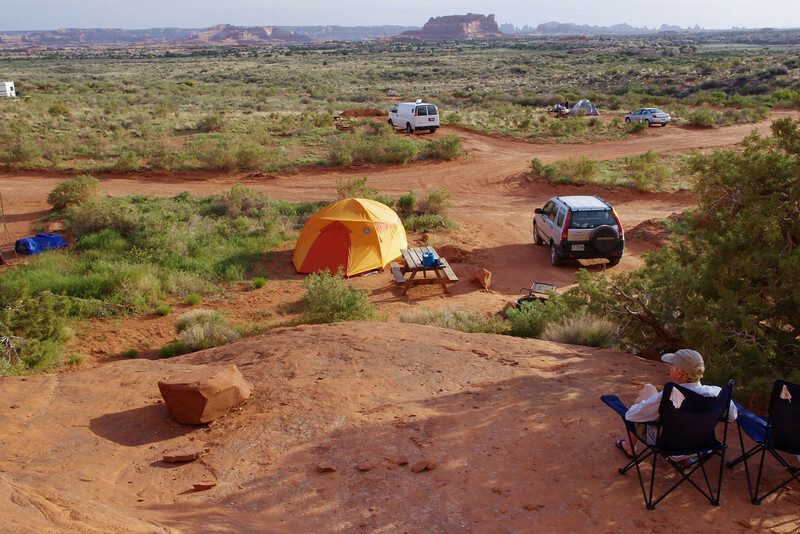 The Squaw Flat Campground in Canyonlands National Park (Needles District) is first come, first served - and it fills up every day in May. 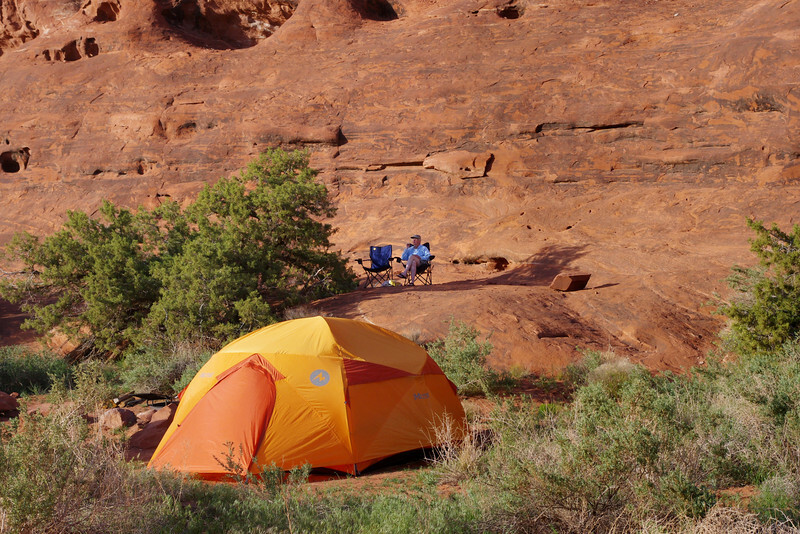 Rather than wasting vacation time hanging around the campground waiting for someone to leave, we decided to stay at the Needles Outpost, a private campground just outside the entrance to the Needles District of Canyonlands National Park, Utah. Our camp at the Needles Outpost, a private campground just outside the entrance to the Needles District of Canyonlands National Park. Good views, but less than ideal geography - most sites get no morning sun, but more than you want in afternoon. Also, lots of exposure to dusty wind, and little privacy. Castle Valley Road, east of Utah 128 north of Moab. Castle Rock, viewed from the Castle Valley Road. 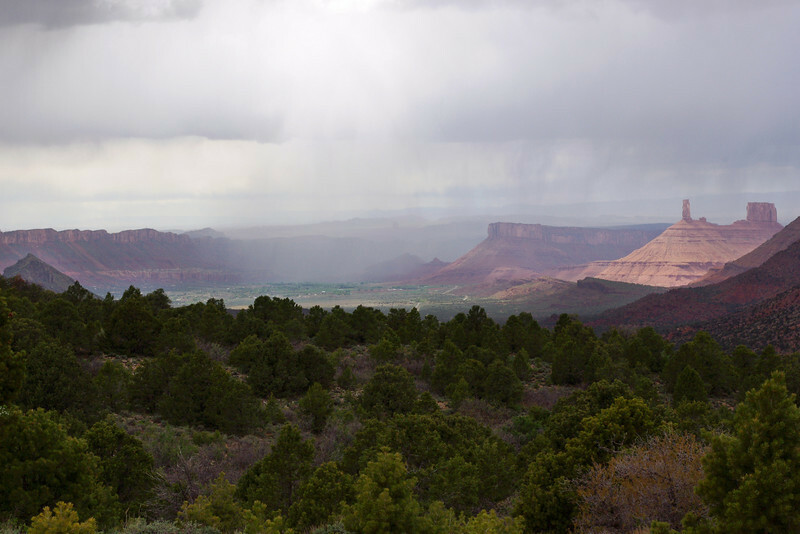 Rain showers over a desert canyon. Distant view of Castle Rock from the Castle Valley Road. 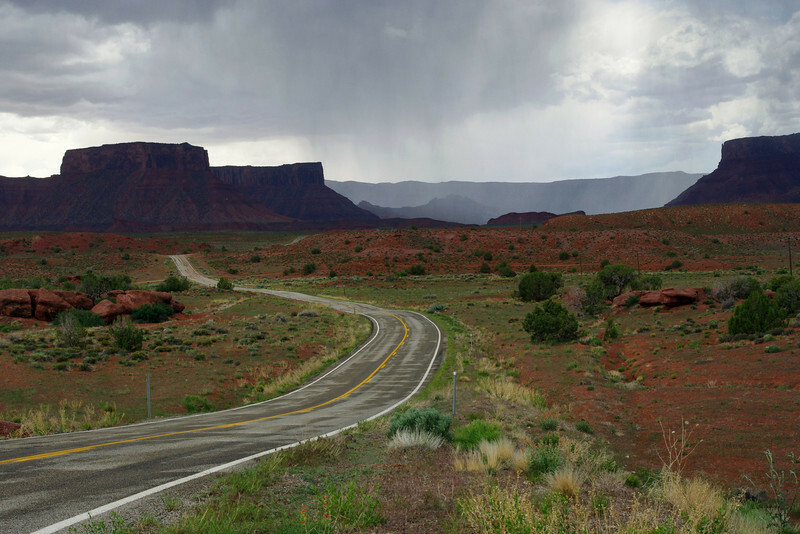 While driving up into the La Sal Mountains on the Castle Valley Road, gray skies turned to rain, and rain turned to sleet, and the sleet turned to snow, and the road turned every which way. We turned around. Our campsite in the Hal Canyon BLM campground on the Colorado river, north of Moab on Utah 128. 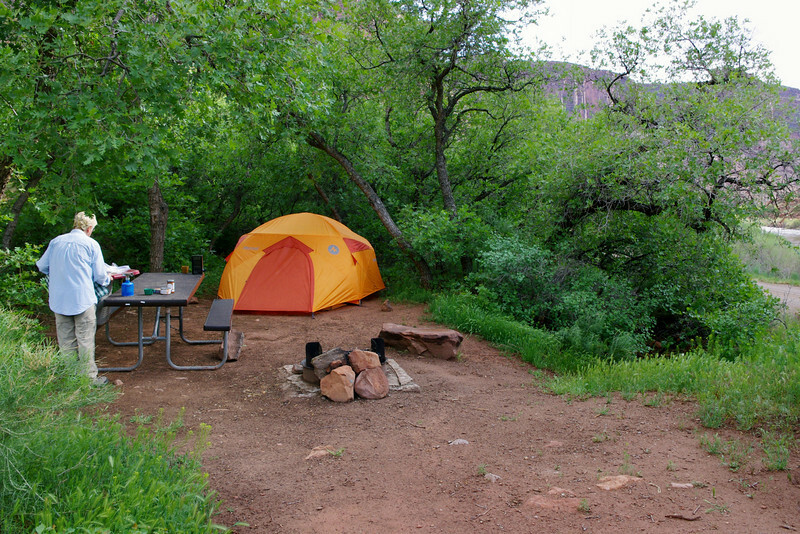 This was the best campsite on the river, due to the protection from the wind given by these little Gamble Oaks. Most campsites along the river were very exposed and 40 MPH gusts had to be a problem for many campers.